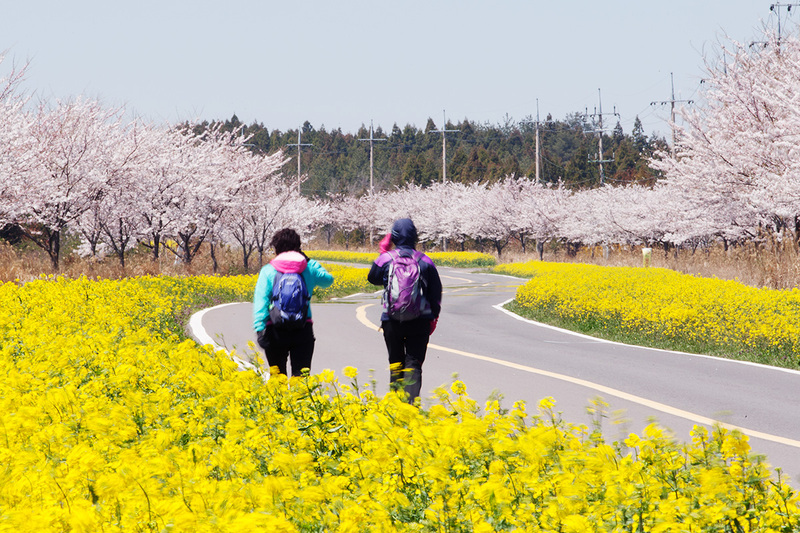 Jeju spring flower journeys: Get your bloom on! and here’s one more for your consideration. It was originally published on our VisitJeju.net site. A landscape of light pink and bright yellow of the cherry and canola blossoms are the harbingers of spring. Visitors record the island’s beautiful vistas for posterity. When their vibrant colors fade, it’s time for the lotus flowers to make an appearance. Follow us as we walk along a flower path on a pleasant Jeju spring day. 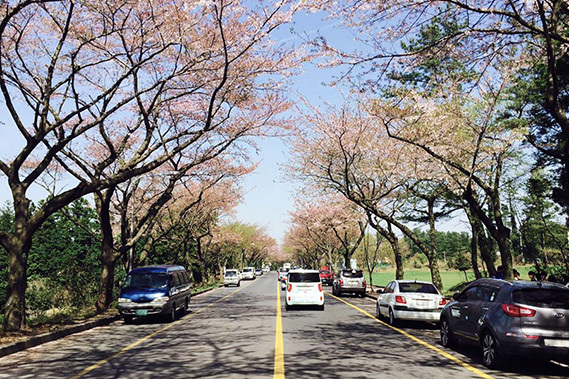 If you seeking out the cherry blossoms within the city limits of Jeju City, then look no further than the original cherry blossom street just a short trip from the airport. This neighborhood of old Jeju City burst to life in the end of March, early April with brilliant pink blossoms. At the height of the season, various food markets and flea markets spring up beneath the beautiful, fragrant natural canopy. Public transportation: From Jeju International Airport take bus 2400 (Yongmun Intersection), bus 100 (Samyang 1-dong, Jeju High School) and get off at the Intercity Bus Terminal stop. The total trip takes about 21 minutes. 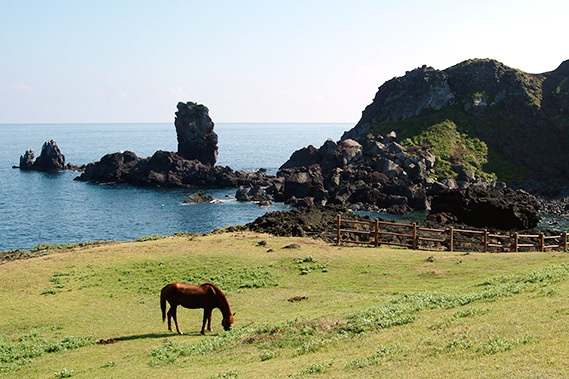 In spring, they say, Jeju changes into its yellow apparel. That’s thanks to the canola blossoms, which cover large tracts of the island. One area that is particularly noteworthy in this regard is at Sanbangsan Mountain. Here the blossoms contrast pleasantly in the bright sun with the backdrop of white clouds, blue sea and black basalt rock of the mountain. Since the area is quite large, there is no one special place from which to capture that perfect shot… every angle is special in its own way. Public transportation: From Jeju Intercity Bus Terminal take bus 750-1 (Hwasun - Sagye) and get off at the Sanbangsan stop. The total trip takes about 1 hour and 13 minutes. There is an island landscape that’s particularly calming to look at — it’s a pond covered in lotus flowers. The pure whiteness is mixed with an ever-so-delicate shade of pink. You can find this pond at Haga-ri, Aewol-eup, Jeju-si. The leaves of the lotus are large and pillowy as they stretch across the water. There is a wooden deck erected upon the pond, so you can get a closer look. Public transportation: From Jeju Intercity Bus Terminal take bus 960 (Jeju - Hagwi - Haga - Dongmyeong) and get off at Haga Intersection. The total trip takes about 42 minutes. 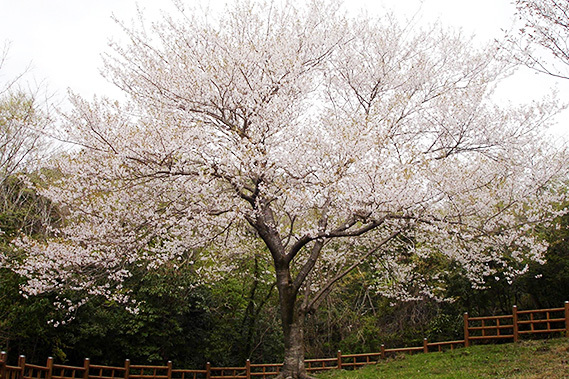 The cherry blossoms of Jeju are often confused with a species originating in Japan. However, recent DNA testing has shown that the Jeju Cherry is indigenous to the island. 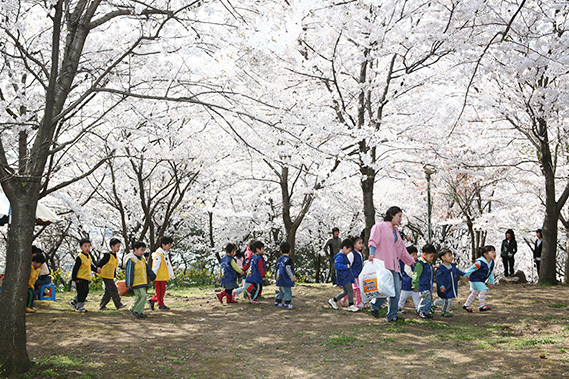 One great spot for cherry blossom viewing is at Sinrye village on the 5.16 Road which connects Seogwipo and Jeju cities. The Jeju Cherry has been designated natural monument No. 156. Public transportation: From Jeju Intercity Bus Terminal take bus 781 (Seongpanak-Siheomjang) and get off at the Suakgyo stop. The total trip takes about 57 minutes. Public transportation: From Jeju International Airport take bus 2400 (Yongmun Intersection), bus 100 (Samyang 1-dong, Jeju High School) and get off at Dongseong Village. The total trip takes about 16 minutes. Public transportation: From Jeju Intercity Bus Terminal take bus 500 and get off at the Jedae Apt. stop. The total trip takes about 44 minutes. Public transportation: From Jeju Intercity Bus Terminal take bus 710 and get off at the Goseong-ri Roundabout, then switch to bus 910 and take that until the Seopjikoji stop. The total trip takes 1 hour and 46 minutes.